I have to say that I was pretty surprised that anyone would do a kit in this scale of this sort of ship. It is by no means a small undertaking and with a one-piece hull that measures out to about 2 feet in length is one that will take up quite a bit of space on your display shelf. 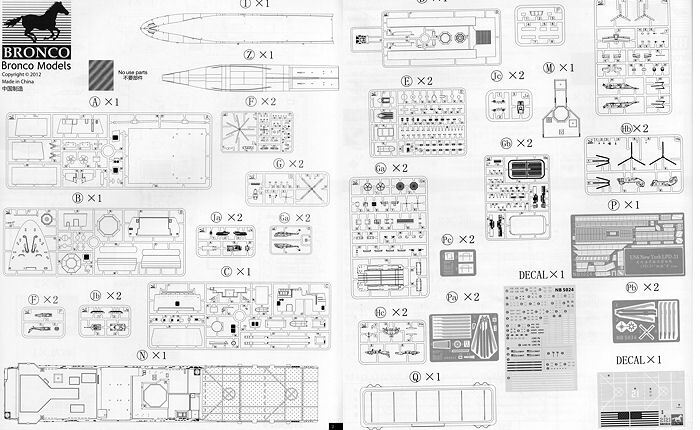 The kit can be built either full hull or as a waterline version. It does not appear to be able to be built with the well deck flooded. As it is a modern ship, the number of external fit tings, while quite complete, is not huge as you would find on a WWII battleship or an aircraft carrier. There are two major towers on the ship which I have to assume are part of the ship's radar suite. They, as well as the rest of the ship, have a lot of flat angles. Around them and atop them are some other smaller radar domes. By comparison, the exhaust stacks are quite small and rather unobtrusive. There are small life preserver assemblies that fill up quite a bit of the side space on the upper decks. Small boat openings are provided along the superstructure sides, which are generally flush with the outer hull sides. These have photo etch doors and can be posed open or closed. Dotted around the weatherdecks are small close in defense guns. Missile launchers are included for self defense and there is a larger bun on the aft deck above the landing pad. A rather large crane is also part of the fit. I should mention that there are several photo etch frets included. 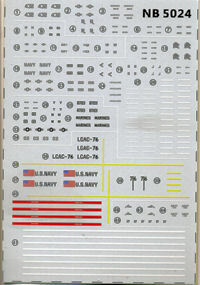 Some are for the aircraft and landing craft, but most are for the ship itself and has a large name plate as part of the set. The set includes railings and ladders. It does seem as if all the areas are covered for the railings so no need for any aftermarket in this respect. A full set of nets around the landing pad are also provided, this making up a rather goodly portion of the ship. Most of the upper hull is a single molding with only a small forecastle section. The hanger bay door is molded shut as there is nothing behind it. This is not true of the well deck. There is a well deck provided and this can have the deck doors on the aft part of the boat modeled open. The kit provides quite a number of various craft and vehicles. All of the aircraft are molded in clear plastic and you get two of each. This includes CH-46 Sea Knights, V-22 Ospreys, CH-53 Sea Stallions, AV-8B Harriers, and MH-60 Knighthawks. 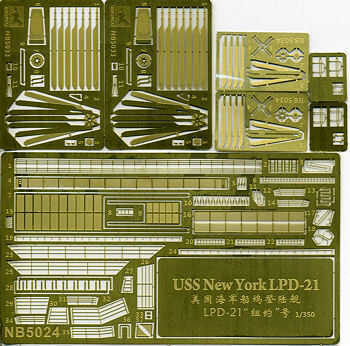 Several of the photo etch frets are for helo blades and all the helos can be modeled with the blades folded. A pair of LCAC's are also in the kit and you have a pair of Hummers, M1A tanks, and AAVTP7A1s to place inside them. These later items are not in clear plastic! Instructions are quite well done and presented in Bronco's usual glossy paper full color book format. A variety of paint references are provided. 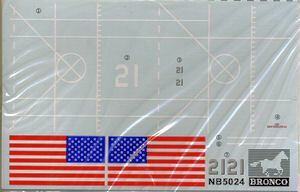 There are a pair of decal sheets included. One is specifically for the ship while the other provides markings for all of the additional aircraft and vehicles. They are well printed and should work just great. The big US flags are supposed to be attached to your favorite backing material and strung between the forward tower and a smaller support. While not inexpensive (and what is anymore when it comes to large models), this one is very nice. It is a Bronco mold and the kit is quite complete. While not simple, it is not complex, either, and should be a pretty straight forward build.